Located along the west bank of the holy River Ganges in the state of Uttar Pradesh, the city of Varanasi is a sacred Hindu pilgrimage site that one of the oldest cities in the world. It has stood as a symbol of Hindu renaissance and preserved the traditions and rituals of Hindu philosophy since ancient times. Millions of pilgrims from distant lands have come here in search of divine blessings. Varanasi is lined with Ghats that stretch right across the bandks of the Ganga, and branches off into myriad narrow lanes that form an integral part of the city. According to Hindu belief, Benaras or Varanasi as it is known, is the cosmic center of the Universe. The city finds mention in the great epics of Mahabharata and Ramayana. It was already an old city when Rome was founded, and was a flourishing centre of trade when Buddha came to Sarnath, some 10 km away, to preach his first sermon in 500 bc. Varanasi lies between the rivers Varuna and Ashi as they join the Ganges. It is also called Kashi, the city of lights. For a short period it was known as Muhammadabad while under Mughal rule. 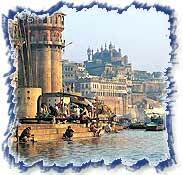 Varanasi has a large number of tourist sites to offer to tourists. » Ghats - The long chain of ghats in Varanasi are one of the most frequently sites, where pilgrims bathe for spiritual purification. There are about hundred ghats in the city and each of them is marked by a lingam. Early-morning bathers, Brahmin priests offering puja and people practising meditation and yoga are common sites. » Durga Temple - The eighteenth century Durga Temple is also known as the Monkey Temple due to the presence of the many monkeys that live here. Durga is represented as the embodiment of shakti or female power, clad in red, riding a tiger and fully armed with Shivas trident, Vishnus discus and a sword. » Bharat Mata Temple - This unique temple has a huge relief map in marble of the whole of Indian subcontinent and Tibetan plateau installed instead of icons of gods and goddesses. » Alamgir Mosque - The Alamgir Mosque is also known as Beni Madhav Ka Darera and is a blend of the Hindu and Mughal styles of the architecture. The mosque was built by Aurangzeb on the site of the Vishnu Temple. » Tulsi Manas Temple - This temple is dedicated to Lord Rama and is situated where the great medieval seer Tulsidas is believed to have lived and written the great epic Shri Ramcharitmanas. 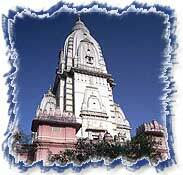 » Vishwanath Temple - The temple is located in the premises of the Banaras Hindu University and was by the Birlas. It was planned by Pandit Madan Mohan Malaviya and is open to all irrespective of caste or creed. » Banaras Hindu University - The Banaras Hindu University is one of the oldest educational centres in India which was built in 1917. Its campus is spread over five square kilometres and houses the Bharat Kala Bhavan, which has a fine collection of miniature paintings, sculptures from first to fifteenth centuries, old photographs of Varanasi and brocade textiles. Varanasi has numerous excursion sites located nearby. Some of the major cities are listed below. » Allahabad - One of the holiest cities of India, Allahabad stands at the confluence of two of Indias holiest rivers, the Ganga and the Yamuna, and is about 135 km from Varanasi. The confluence called the Sangam, is the venue of many sacred fairs and rituals and attracts thousands of pilgrims throughout the year. » Sarnath - Sarnath is a major Buddhist centre where Buddha preached his message of the middle way to nirvana after achieving enlightenment at Bodhgaya. 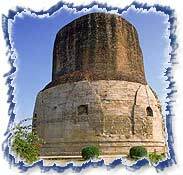 It is located 10 kilometres from Varanasi and Ashoka erected the Famous Stupa here. Several Buddhist structures were built here in Sarnath. » Kushinagar - Kushinagar lies about 51 kilometres from Gorakhpur, and is famous for the Mahaparinirvana (death) of Lord Buddha. The town was once celebrated as the centre of the Malla kingdom and has many stupas and viharas that date back to 230 BC-413 AD. » Ramnagar Fort - The Ramnagar Fort with its interesting museum lies a small distance from the Asi Ghat and is worth a visit. Varanasi is well connected by air to several cities in India. It is on the popular daily tourist service Delhi-Agra-Khajuraho-Varanasi route. Is also has two railway stations, the Kashi and Varanasi Junction, as well as the Cantonment Station for rail travel. We provide complete pilgrimage tour packages as well as travel and tour services for Varanasi. We also offer complete hotel booking and air booking services, car hire and transport facilities for a tour of Varanasi. We will be happy to help you in any way. All you need to do is fill in the form at the end of this page and send it to us with your travel query, and we will get back to you at the earliest. Varanasi is famous for its Betel Leaf (Paan) and silk saris, which are dream creations of brocade embroidery. Boating in the Ganges and moving around the Ghats is an experience of a lifetime. Summers can be harsh in Varanasi with the temperatures rising up to 45°C, so light cotton clothes are recommended. The monsoon season which starts by late June or early July, is high in humidity. Winters, on the other hand are pleasant with temperatures remaining around 20°C in the day, thought they can touch a low of around 10°C in late December and January. There can also be heavy fog in the early part of the day. October-November and February-March are usually comfortable and sunny.